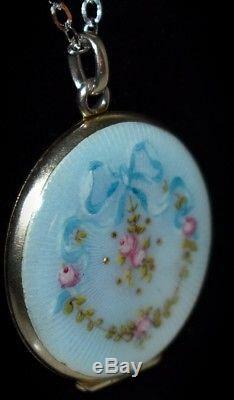 LOVELY Antique STERLING Hand Painted ENAMEL GUILLOCHE Roses & Bow LOCKET & Chain. 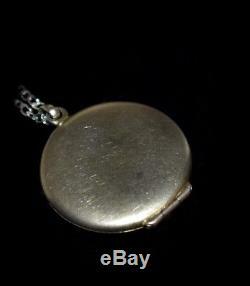 Gorgeous antique Sterling silver locket with roses and bow. Hand painted enamel guilloche with pink roses, green foliage, and a beautiful cascading blue bow. 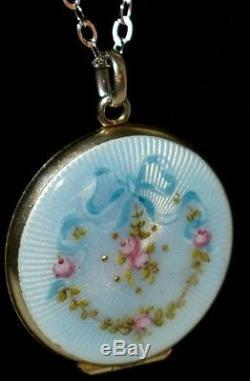 Locket has a white background, but because of the sheen and the blue bow, it looks very light blue. Inside there is room for 2 pictures, there are no covers for pictures. You open the locket with your fingernail, and then just press closed (there is no snap on this locket, locket will not open on its own, it is very securely closed). Absolutely beautiful piece with very light wear. Locket measures 1 1/2 inches up and down (with bale). 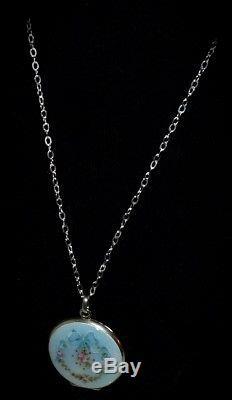 Chain measures 18 inches long. Please view all photos as they are part of the description. Please feel free to ask us any questions that you may have. Please ask all questions prior to purchasing. 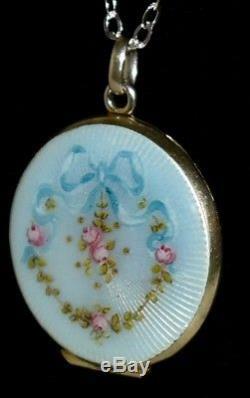 The item "LOVELY Antique STERLING Hand Painted ENAMEL GUILLOCHE Roses & Bow LOCKET & Chain" is in sale since Friday, June 8, 2018. This item is in the category "Jewelry & Watches\Vintage & Antique Jewelry\Fine\Art Nouveau/Art Deco 1895-1935\Necklaces & Pendants". The seller is "angels1804" and is located in Palm Springs, California. This item can be shipped to United States, Canada, United Kingdom, Denmark, Romania, Czech republic, Finland, Australia, Greece, Japan, Sweden, South africa, Thailand, Belgium, France, Ireland, Netherlands, Poland, Spain, Italy, Germany, Austria, Israel, New Zealand, Philippines, Singapore, Norway, Brazil, Costa rica.